One of the fastest growing areas in home automation seems to be lighting. Every day new products come on the market and one of the most popular has been the Philips Hue, thanks to not only simple automation but also the ability to change colors. However, it is not the only one on the market with such a chameleon quality. LIFX also produces bulbs that can set the color to your mood or taste. The LIFX Color 1000 is one of the latest models from the manufacturer and it will do all that other bulbs in this market are capable of. We recently had a chance to try one out and see what kind of performance we could get out of it and the results were fairly good. 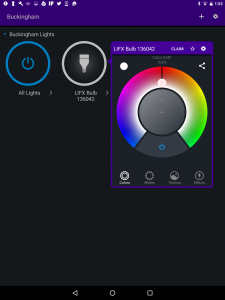 First off you'll have to install the bulb in the fixture of your choice and then download and install the LIFX app, which is available for Android, iPhone and Windows (not Phone). Flip the light on and then launch the app. You'll be greeted by a dialogue box with a few brief instructions which begins by telling you to connect to the bulb. This should be listed under a rather obscure name such as 126043. If connecting doesn't work the first time then turn the light off and back on, wait one minute and try again. If all goes well then your local networks will be displayed, so choose one and connect. A connection will result in a very simple screen displaying two buttons -- one for "All Lights" and one for each of the individual bulbs. Simply click these buttons to turn a light off and on from anywhere. By default, the bulb lights up plain white and looks like any normal bulb. However, you can click the arrow below each power switch and get a color wheel. Spin the wheel left and right to choose whatever shade you prefer. Below this color wheel are four options -- Colors, Whites, Themes, Effects. Whites is exactly what it says, various shades of the traditional light color. Themes is an eclectic mix of options such as "Peaceful", "Energizing", "Tranquil" and more. You'll really just have to play with each to see what happens. By default, it is set to "Intense". Effects is much the same -- scroll through the list and see what each does. Some, such as "Spooky" and "Strobe" are interesting. At the top of the screen near the right, you'll spot a Plus sign. Click this and you'll receive three options, one of which is "Schedule". From here you can begin setting the light up to go on and off at times of your choosing and there are a few options you can throw in if you so desire. 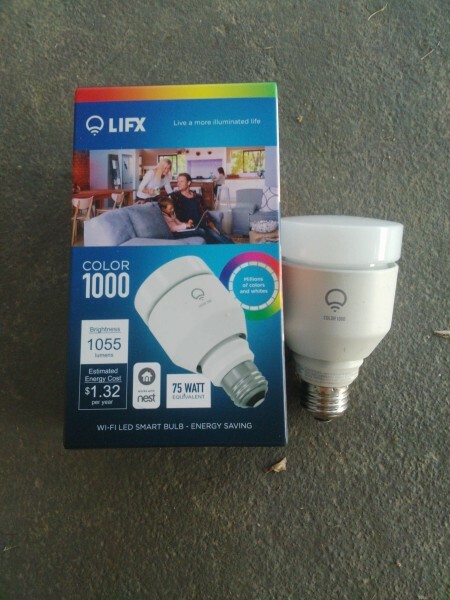 The LIFX Color 1000 retails for around $39, which is a lot for a light bulb, but you have to put standard bulbs out of mind and consider what more this can do. Factoring in colors, effects, schedules and remote control makes the price perfectly reasonable and in line with similarly capable bulbs on the market. Setup is very simple and you'll be up and running in under five minutes, providing you have no Wi-Fi connection issues. The bottom line is that if you're in the market for these type of options in your home then this is well worth investing in.